So after weeks of preparation, late nights and long casting sessions Salute has come and gone for another year. Its always a busy day and again we didn’t get to see much of the show ourselves so have to resort to other people’s photo reports of the day to see what what was going on. As ever we’re completely knackered. Fatally I sat down with the kids last night to watch some tele. Suddenly it was a quarter past midnight and we were all asleep in the lounge. After I got them off to bed I stupidly sat back downstairs. Once I’d woken up again at half three I finally made it to bed! After having a couple of days off, we’ll get all of the new releases on the website to buy over the next few days. Until then its time for a bit more sleep…..
Well, that’s it – the van is packed and ready to go, I’m just running off a last couple of bits and pieces off the printer but otherwise it’s an early night ready for a 7am start tomorrow. There’s been the odd hiccup (some combination of temperature and humidity means that the British spaceships I sprayed this afternoon look like they’ve been pebble-dashed !) but nothing we can’t survive. We look forward to seeing as many of you as possible tomorrow – and for those that can’t make it for one reason of another, there will be many photo reports on the web I’m sure. So … four more sleeps to Salute ! One of the downsides to running a trade stand at a show, especially one as busy as Salute, is that we don’t get much of a chance to wander round, chat to other traders and games, and also to see the games on offer. However, this year I will be making a beeline to see one of the largest games planned for this year’s show, in fact one of the largest games we’ve ever seen; South London Warlords’ Route 66 game. This 36-foot long extravaganza is a 15mm SF game depicting the famous Hammers Slammer mercenary unit attempting to break through to a starport on Cullen’s World. Its just coming up to 1am and I find myself dremeling into the heads of Belgian ladies. Obvious really. What else would I be doing at this time. I’ve one final mould to make for Salute and its the second one for the Bel;gian civilians. Unfortunately the heads aren’t a snug enough fit into the bodies to survive the vulcaniser without moving so each one has to be pinned in place. So I’m dremeling into the necks and heads of Belgian ladies. Five days to go until Salute……. Very quickly before I bundle the sprogs off to school. I did the first couple of castings of the second of our 15mm “hi-tech” buildings last night. Amongst all the other jobs of last weekend I managed to make the first castings of another new 6mm building. A second tower for our desert building range. Its shown below with the existing small tower for scale purposes. I’ve also just finished the mould for the second of our new 15mm hi-tech buildings. Hopefully I’ll do the first casting tonight or tomorrow so expect a preview once its popped out of the mould. Ten days to Salute (aaaaghh !!!). So here we go … details and pricing for some of the Salute Releases. We’ll update this page with more as we go along so you may want to revisit again before the day. As I suspected he might, Phil popped up with yet another mould which I didn’t know about – so AmRep players now get a new fighter type, the Goshawk. Two weeks and counting … well, slightly less in fact, just 13 (count ’em !) days until Salute. Which is all a bit scary, it seems to have crept up on us again. We’re on stand TM04 – go in the main entrance, turn immediately right and walk to the far wall – we’re four stands down. We’re finalising our new releases for the show – we know pretty much what we’ll have, and it’s quite an impressive list, around forty new models. And it might be more, as I never know if Phil’s going to turn up at the last minute with a new mould that he’s managed to squeeze in ! We’ll have the first batch of ten models available, along with two fleet packs. Phil’s finishing off the moulds for a grand total of ten Indonesian vehicles, plus army and company packs. We’ll have the remastered German Thor MBT and Lynx APC available, along with the EuroFed Montsabert and Tassigny (all with several turret variants). Stock of these may not be great. We’ll have a number of new models in the Desert Buildings range – I don’t know exactly what yet, it depends on what Phil gets done ! We should have the first of the new City buildings available, and possibly more (who knows). We’ll have the Belgian refugees ready at last. Of course we’ll have stock of all of the recent new releases – the Pommerania, PacFed vehicles, 2mm buildings etc. 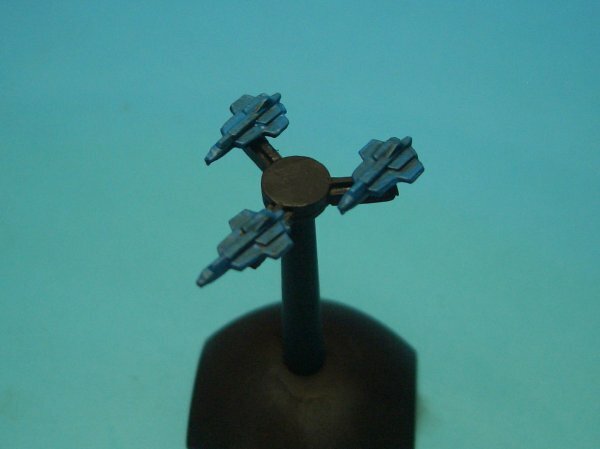 And don’t forget that we also carry Angel Barracks’ 6mm (figures only) at shows too. We’re happy to take advance orders to be collected at the show. If you want to pay in advance, you can place an order from the website; go to the online ordering page and select ‘Collect in Person’, then place and pay for your order as normal. This won’t charge any postage costs, and then you can just turn up on the day and collect your items. Please get any show orders in by the end of Thursday 11th April, otherwise we may not have time to complete them. Obviously you can’t order any of the new releases this way since they aren’t on the website yet (and we haven’t published any prices yet either). If you want to reserve any of these, or you want to make an advanced order but pay on the day, e-mail us and we’ll get back to you with a total cost.